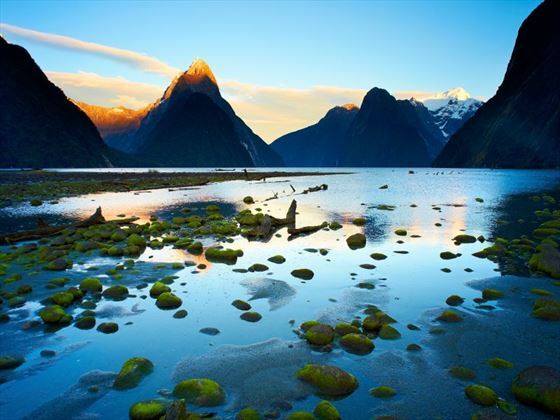 Starting and ending in Christchurch, this fantastic nine-night Independent Coach Tour will show you the natural beauty of New Zealand. 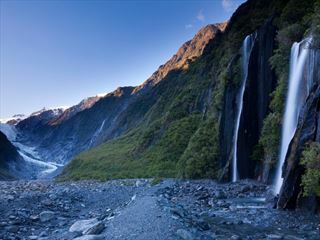 Whether you’re ascending the Southern Alps on the scenic TranzAlpine train, walking along the icy floor of the West Coast Glaciers, cruising through the soaring Milford Sound, or embarking on a Glaciers Explorer Tour to get up close to the Tasman glacier and gigantic icebergs, your journey will be full of amazing ‘pinch me’ moments you won’t forget (NZ). 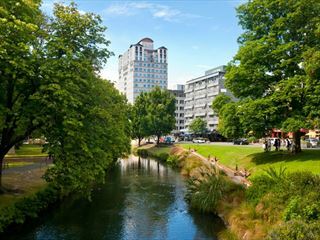 Today you will arrive in Christchurch, where you will be met by a private driver and transferred to your hotel. If you have time, we’d recommend exploring the city, including an informative and fun trip on board the Double-Decker Bus Tour. In the morning you will be transferred to the train station, where you will board the TranzAlpin train for a phenomenal trip. 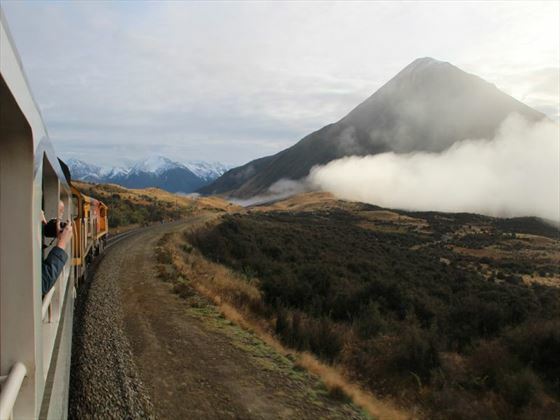 Known as one of the world’s greatest train journeys, you’ll travel from Christchurch to Greymouth, taking in stunning views of the Canterbury Plains, magnificent gorges and sweeping river valleys. From there the train will ascend into the Southern Alps, before travelling through beech rainforest to the West Coast town of Greymouth. Once you’ve arrived in Greymouth, you will hop on the InterCity coach and journey to Franz Josef Glacier, stopping at Hokitika for a quick refreshment along the way. Soon you’ll arrive at your accommodation, where you’ll be met by a Glacier Valley Eco Tours representative and taken on a short tour of the glacier. Take in the amazing views from the viewing platform, or enjoy one of the short walking trails. There are many different activities you could partake in today. Walk along the glacier face without a guide, or join in with a licensed guided tour and climb the Franz Josef Glacier, venturing through luscious rainforest and gaining access to exclusive trails. Fancy something a little more laidback? You could explore the Glacier Hot Pools and chill out in this secluded oasis. 7.30am – Early this morning you will hop on the Newmans coach. 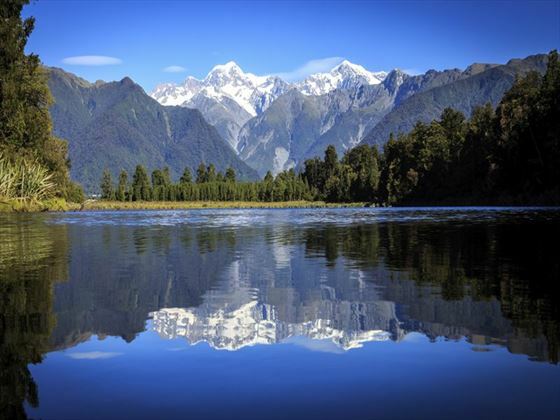 8am – Your journey will take you over large rivers, through Fox Glacier, and past charming West Coast townships including Bruce Bay and Jacobs River. 9.45am – At this time your coach will arrive at Paringa, where you’ll enjoy a 20 minute break at the Salmon Farm Tearooms, helping yourself to a refreshment whilst you watch the large salmon swimming in the ponds. You’ll then continue on past Lake Moeraki to Knight Point for a gorgeous view of the rugged coastline. 10.55am – Once at Haast you will stop for lunch, purchased at your own expense. The coach then passes over the Gates of Haast Bridge and crosses the Haast Pass itself. 1.05pm – Your next refreshment stop will be at The Country Café near Makaroa. 1.35pm – Now you will travel to the township of Wanaka via the shores of Lake Wanaka, and across ‘The Neck’ of Lake Hawea. Then after a quick pit stop you will journey to Cromwell on the shores of Lake Dunstan, a manmade lake nestled behind the Clyde Dam. You’ll then depart Cromwell and follow the road that winds through Kawarau Gorge, past sweeping vineyards and the world’s first Bumgy Jump bridge before arriving at the Wakatipu Basin. 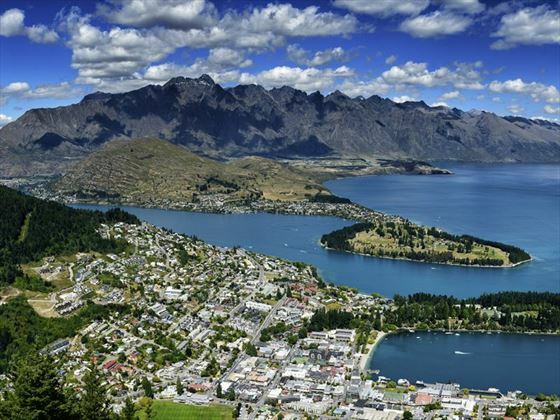 4.30pm – Soon you’ll arrive in Queenstown, a popular year round resort. During the journey you will need to advise your driver where you’ll be staying in Queenstown. Today is free for you to explore. There are plenty of activities you can enjoy in this adventure-fuelled city, from a cruise on the TTS Earnslaw and a jet boat tour, to the Skyline Gondola and decadent wine tastings. 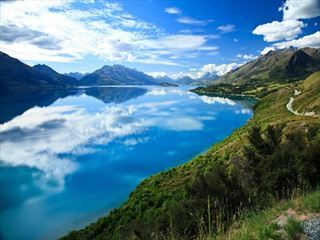 Today you will travel on a luxury glass-roofed coach in Queenstown, winding along the shores of Lake Wakatipu and on to Te Anau whilst listening to the driver’s informative commentary. After a quick tea break in Te Anau, you’ll then head on to Milford Road for a few photo stops and short walks. You’ll then board the gorgeous Milford Mariner for a special dinner, bed and breakfast experience along Milford Sound. 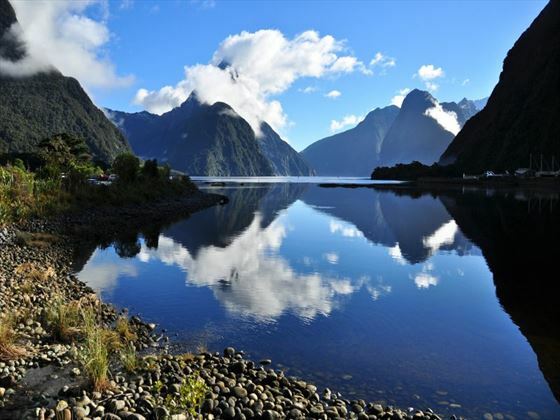 Today you will sail through the stunning fiord to the Tasman Sea, and anchor for the night in Harrison Cove. Once you’ve anchored, you can spend some time kayaking or relaxing on the deck, before tucking into an evening buffet. Your cruise will return to Milford at 9.15am, where you’ll hop back on the luxury coach and drive through Te Anau. 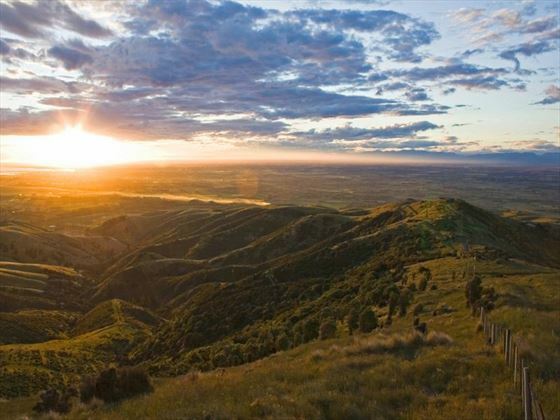 Along the way to Queenstown, you will pass Mossburn – the deer capital of New Zealand, and Kingston – home to the classic steam train The Kingston Flyer. Before your morning tea at Omarama (own expense), you will drive through the rugged Kawarau River Gorge, the fruit growing region of Cromwell, the shores of Lake Dunstan, and across the Lindis Pass. Afterwards, you will continue through the Mackenzie Basin to Mount Cook National Park, home to Australasia’s highest mountain. Tuck into a delightful lunch (own expense) in Aoraki/Mt Cook Village, before taking the opportunity to enjoy a scenic flight with The Helicopter Line or Mount Cook Ski Planes (optional, and weather permitting). Your day gets to a stunning start, travelling along the Mt Cook terminal lake to see the 500 year-old icebergs up close. The Glacier Explorers Tour is incredibly unique – there’s only three in the world. Sail along this beautiful lake and explore usually unseen and inaccessible areas of New Zealand’s biggest glacier – The Tasman. All accommodation in motels, 3* or 4* hotels. Please note that the pricing is based on motel accommodation, should you wish to upgrade, speak to one of our travel experts for a quote.